As a mom of three, it is my mission to organize my household tasks in a way that saves me time. Keeping the children engaged throughout the day is a task in itself, so I can’t afford to spend hours in the kitchen, despite the fact that I enjoy it so much! I’ve been making homemade baby and toddler food for a few years now, and while I absolutely enjoy the health benefits of making their food myself, it can take up a considerable amount of time. Then, in comes Baby Brezza‘s One Step Baby Food Maker. I have been using it for the last few weeks and I have lots to share about it and my experiences with it. The Baby Brezza One Step Baby Food Maker provides parents with a way to prepare homemade organic baby food without the fuss of standing in front of a stove while it’s cooking. At the push of a button, you can steam and blend a combination of ingredients to create gourmet masterpieces for your little ones. The bowl holds 2.5 cups and the machine only weights 3.3Lbs! The second I put it down on the kitchen counter, I realized that it had little suctions at the bottom. This means that it won’t slide around, which is essential when handling hot food. The Baby Brezza One Step is straight forward and easy to use. Add your water, wash and cut ingredients of your choice, add them to the bowl, set the timer and the machine does the rest! It’s pretty user friendly. The kids helped me prepare my first batch and we all had fun. It’s not as loud as our conventional blender, and the blending process is fairly quick. It makes me sound lazy to say that life is easier when everything is at the touch of a button, but in all honesty, having kids requires much of our time and energy, and any device that allows you to get work done with minimal attention is a great help. •At only 3.3Lbs, this compact machine is easily portable, which makes it perfect for travel. Take it on vacation and use in your hotel room, bring it with you while seeing family or friends. Not only is it convinient, but might just encourage someone else to make their own homemade baby food someday. •It beeps before switching from steaming mode to blending mode. This feature seems simple, but it’s more useful than you think. Last week I was preparing food with it, and baby fell asleep. Once the beeping began, I was able to jump up and stop the second stage from taking place. Baby slept soundly for another two hours, and I was able to blend the food at a later time that day. •A regular handmixer works fine for making baby food, but if you’re looking for a machine that does everything for you, this is the way to go. •Many parents are gravitating towards glass and silicone products that are designed for baby feeding. While the Baby Brezza One Step bowl is made of plastic, it’s also BPA free. •Although the Baby Brezza One Step is marketed as a tool for making purees, I noticed fairly quickly that it’s useful even after the early weaning stages. You can prepare steamed veggies, fish and more for both children and adults. Prepare tasty smoothies, applesauce and more with it. The possibilities are endless. •Do you prepare your baby food in advance and freeze for later? Many parents are reluctant to use a microwave to defrost frozen food. The Baby Brezza one step allows you to defrost your homemade baby food. •Afraid of overcooking or undercooking? Keep their cooking guide handy. *****I have received a Baby Brezza One Step Baby Food Maker to try out. I have not been financially compensated for writing this review. All opinions are my own. 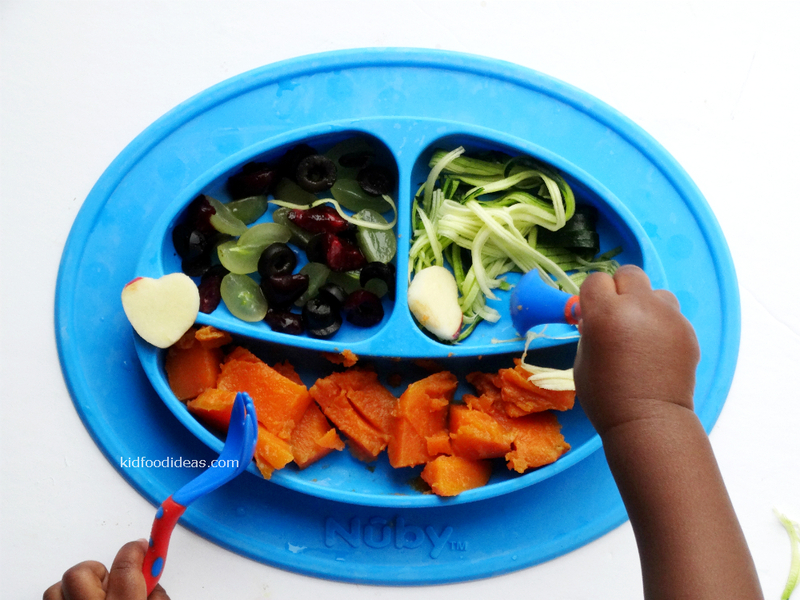 The weaning stage can be such a fun time for children. It’s a milestone in a child’s life that includes the exercising of motor skills, and exploring a new world of flavours and textures with their senses. Weaning is not a stage that is restricted to the home, as some families enjoy eating out, going on picnics and visiting family. In those cases, it can be a hassle to have baby on your lap. Some restaurants and homes have high chairs to accommodate, but to be honest, the combination of germs and my desire to not inconvenience anyone gets in the way. I prefer to bring my own items to do what I need to do when it comes to the kids. That is where the Chicco TravelSeat comes in. When we travelled to see family and friends in summer, I often brought along our standard travel seat. While it is easy to use at home, it’s bulky and a hassle to carry around. When I first saw the Chicco TravelSeat, I couldn’t believe my eyes. Not only is it compact, but it’s sturdy and strong. •Rubberised Arms: Don’t be shy to take these to a restaurant or a friend’s house. The rubberised arms are designed to fit most tables without scratching them. •Compact: I can’t stress how useful this feature is. I am a mother with three children and only two hands, so being able to reduce a high chair to a single lightweight bag that I can throw over my shoulders means more room for me to grab a child or two, plus my diaper bag. I don’t have any cons about this product, so I had to browse other product reviews to see what people were saying (I’m a huge snoop!). A few people said they found the seat hard to clean, so I will give my take on that. To anyone who has had this issue or thinks this may be a problem, let me share two tips. First of all, the seat is removable. See the snaps on the side? Yep, those ones! You can (very easily and quickly) remove the padded seat and toss it in the machine for a quick cycle. The other tip I will share is that I often cover mine with a seat cover. Brands like Sproutshell make multiuse covers that you can place over your chair to protect it. In this way, you can preserve the seat for a longer period of time, and not have to worry about running it through the wash too often. ***I have received a sample for review purposes. I have not been compensated for this review. All thoughts are my own. In our home, Milton has become a household name within a matter of hours. It was that easy. The box arrived, I called out “Milton is here!” and the kids’ attention had been caught. We opened our box to find our new friend, Milton, along with a Meet Milton book. Before using Milton, I ran him through the dishwasher that night, and sat with the kids before bed to read the story about him and his adventures. The book is pretty fun to read, as it features images and text that describe Milton’s story and how he got to this point. It’s a cute story, and after reading it, I felt that the kids were set up to use him the following day. •Milton keeps his mouth open nice and wide to help me show the boys how to care for their teeth. I am able to show them that with brushing after meals and flossing each day, he is able to avoid cavities! •Milton is a great bath time companion. He loves feeling the water from the shower head on his bald little head, and has a blast in the bathtub as well. No tears over here! •He’s a great chew toy. Milton is a sweetheart. He doesn’t complain when our seven month old girl eases her sore gums by nibbling on him throughout the day. •He is our snack sitter. When the boys have not finished a snack, they have Milton guard their plates or bowls while they run off to play until they are ready to finish eating. •Milton is easy to clean. Simply squeeze the sides to pop his mouth open, and use a baby bottle cleaner or sponge to clean him. This is a great way to get toddlers to practice helping in the kitchen as well. What greater way to teach responsibility than to have them clean their own mealtime companion after meal time? He’s also dishwasher safe in case you’re not in the mood for hand washing. •He’s safe for children to play with. Most of our tableware and utensils for the kids are made of silicone, so you can imagine my joy when I discovered that Milton is made of 100% food grade silicone, making it BPA free, phthalate free, and PVC free. He’s a squishy little guy, making him a great companion for our youngest, who will chew on anything in sight. •This isn’t really a con, because it’s not about the product itself, but I will leave this header to attract attention. On their FAQ page, the website mentions that the Meet Milton book is not just to introduce children to their new mealtime companion, but also serves as a user manual for parents. This is true in my experience. What I would like is to see their website place a bit more emphasis on the book, because its role is a bit underplayed. I found it informative, the kids had a blast reading it at night, and it motivated them to try new things even before they had Milton join them at the table. It’s too awesome to not brag about! I would love to see more focus on the book within their website, so that visitors can get as excited as I did after reading it. Here’s a great fact about Milton that I learned from the website. For every Milton made, $1 is donated to Feed My Starving Children to support their “mission of feeding children hungry in body and spirit”. It’s one thing when a brand comes out with a fun hip product that works well with the kids, but the fact that the makers have made it a point to give back (on a quarterly basis) shows that they also have heart, and it doesn’t get better than that! Click here for details on how the folks over at Sixty LLC give back. For the month of August, use discount code “kidfoodideas10” to get 10% off your purchase! Free shipping to addresses in the USA! ***I received Milton for review purposes. I have not been compensated for this review. All thoughts are my own.